It represents a computer environment like a Unix/Linux shell where a command is entered and the system responds with an output. Question: What is full form of REPL? Question: How to start REPL? Type following command and press enter key. Question: How to calculate 2+2 in Node REPL? Just type 2+2 and press enter key in REPL Mode. Question: How to see previous result in REPL? Use Underscore to see the previous results. Question: What we can do in REPL? Question: What are most common REPL Commands? ctrl + c ? terminate the current command. ctrl + c twice ? terminate the Node REPL. ctrl + d ? terminate the REPL. Up/Down Keys ? see command history. tab Keys ? list of current commands. .help ? list of all commands. .break ? exit from multiline expression. .clear ? exit from multiline expression. .save filename ? save the current session to a file. .load filename ? load file content in Node REPL session. Question: What is the difference between local and global module in Node.js? When we Installed a module locally, then we need to use require() to use module. When we Installed a module globally, then we need't to use require() to use module. Question: When to use local and global module? If we are going to run it on the command line, then we must install the module globally. Question: How to install mysql locally? Question: How to install mysql globally? Question: What is package.json in module? All npm packages contain a file, usually in the project root, called package.json. package.json file holds various metadata relevant to the project. This file is used to give information to npm that allows it to identify the project as well as handle the project's dependencies. It can also contain other metadata like description, version, license and configuration data. Question: Give the sample of package.json? Question: Does package.json exist for each module? Yes, each package contain the package.json. It exist in root of module. Question: How to search a new module? Question: How to update existing module? Question: Can we create a new module and published? Yes, We can create a new module. Create a new module using "npm init" commond. Add the user for new module. Publish the node module using "npm publish"
Question: Give example Blocking vs non-blocking in node.js? Question: How to install express-session ? Question: How to include express-session? Real Time Chat With Node JS. Difference between CreateConnection and poolConnection in NodeJS. How to execute MySQL queries in node.js?. How to make a node.js application run permanently. 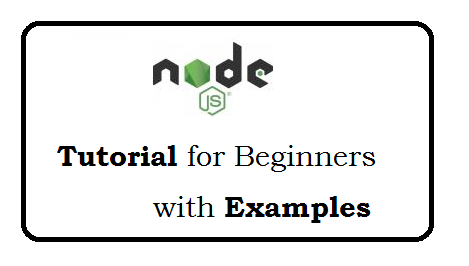 Node JS tutorial for beginner. Node.js questions and answers for 1 year experience. What is NodeJS API wrapper?. NodeJS Interview Questions and Answers for. NodeJS Interview Questions and Answers for beginners. How to create http server in NodeJS?. How to install and Connect to MySQL in NodeJS?. Express Js Interview Questions and Answers. Node Js Interview Questions and Answers for Experienced.